I have been making slow by stead progress on the Standamaran project. In case you missed it the plan is to build a stand-up paddle-board over the winter but to make it a stand up catamaran with two pontoons instead. That way I can fly fish from it standing up. 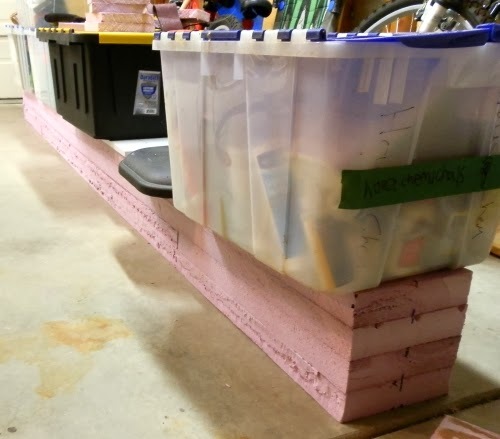 It started with building two 8" x 8" x 10' foam beams by gluing together 2" thick foam boards which I cut from a 4' x 8' x 2" piece of foam from Home Depot. This foam is extruded polystyrene (aka Styrofoam) and weighs about 1.5lb per cubic foot. For the glue I used 3M spray on Styrofoam adhesive. POST PROJECT EDIT: After completion of the project I can confidently state that the 3M styrofoam adhesive was a mistake. Because the foam is completely non-porus this kind of glue NEVER completely dries in the middle of the pontoons. 5 months later when doing the fill coat the styrofoam adhesive was STILL slowly outgassing. Just enough to create dozens and dozens of tiny bubbles and pits in the hot-coat. It was more of a cosmetics issue and annoyance than a functional issue but for anybody following my lead, I would use either Gorrila Glue or Epoxy or some other kind of glue that catalyzes instead of drying. 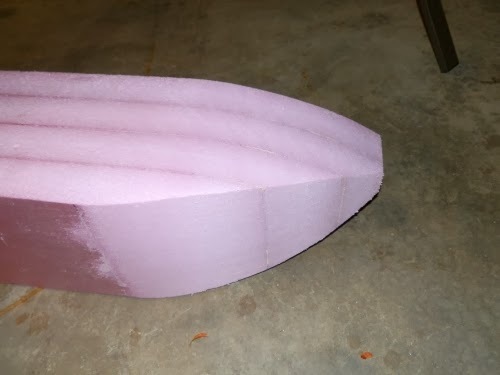 Of course, the best option would be to actually order billet foam large enough to make the pontoons out of one piece. I then sanded the sides with 40 grit sandpaper and formed the front and back tapers. The front tips of the pontoons will have a long taper in the top view. The aft end of the pontoons will have a shorter tear-drop taper in the top and side view. This is what the pontoons looked like at this point. On the final product there will be a platform between the two pontoons of course. The next step was to put a keel on the pontoons. This is at least partially in order to (hopefully) reduce drag a little but there were two other reasons. First of all I needed to reduce the volume of the pontoons a little. As it was the Standamaran was only going to draft 3" or even less. I was worried that a 3" draft wouldn't be enough for it to track well. 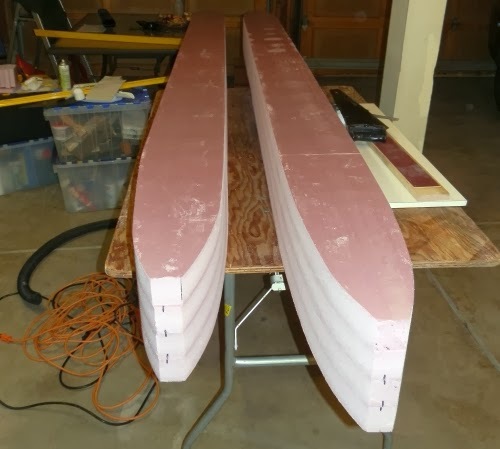 I also wanted there to be a 3" wide strip going down the whole bottom of each pontoon that I can heavily reinforce when I glass them so that there is something strong that will hit bottom first. The pontoon on the right has had the keel shaped in, the one on the left has not (looking from aft). The next picture shows the front from one pontoon (left) and the aft of the other (right) after shaping the keels. Next I will radius all the hard edges, make the platform and then it will be time to glass it! Wow, I like your commitment. I'm eager to see the finished product. You may have to wait till spring for the finished product. I may have a couple other projects get in the way. Love the paddle! Actually what a deal, also can't wait to see the finished ship. Yeah, that paddle is fancy isn't it? 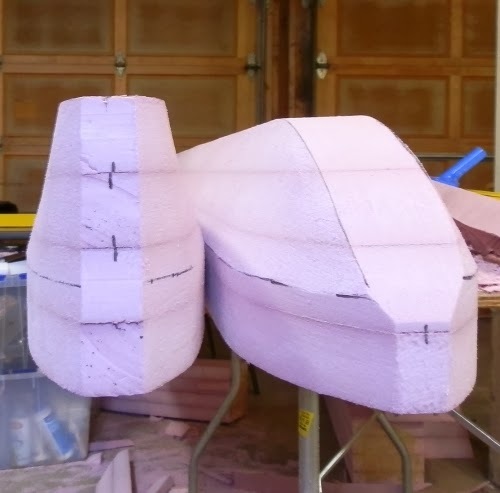 So the pink foam is just the pink panther insulation high density foam they sell? 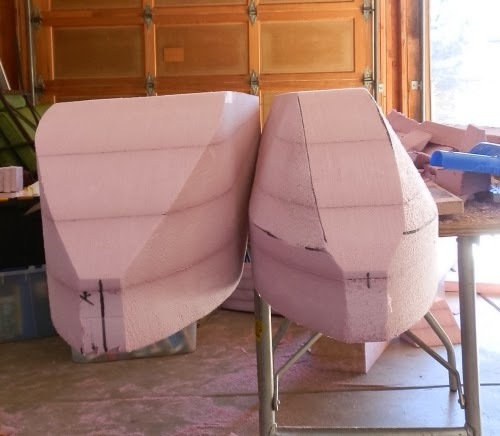 I'm looking to reinforce the inner side wall on my gheenoe when I remove the middle seat and that stuff looked like it would fit the bill. Nate - I don't think it is branded pink panther, but yeah, I think you have the idea. 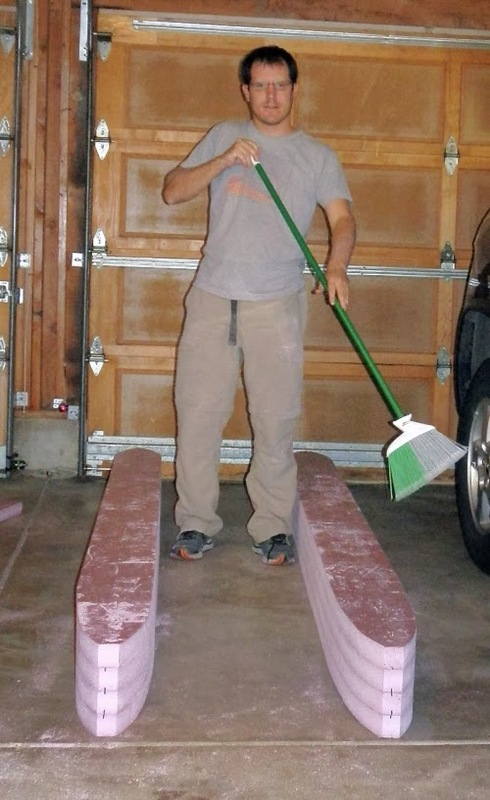 Foam insulation boards from Home Depot or Lowes. The Home Depot stuff is pink. The Lowes stuff is Blue. Awesome. Thanks. I was going to take the gamble on that stuff before I saw this. Now I feel better about it. Did you know you can create short urls with AdFly and make money for every click on your short links.